It was like a dream. There I stood, in front of the book signing table, TWO Newbury Medal winning authors facing me: Clare Vanderpool (Moon over Manifest, 2010) and Jerry Spinelli (Maniac Magee, 1990). 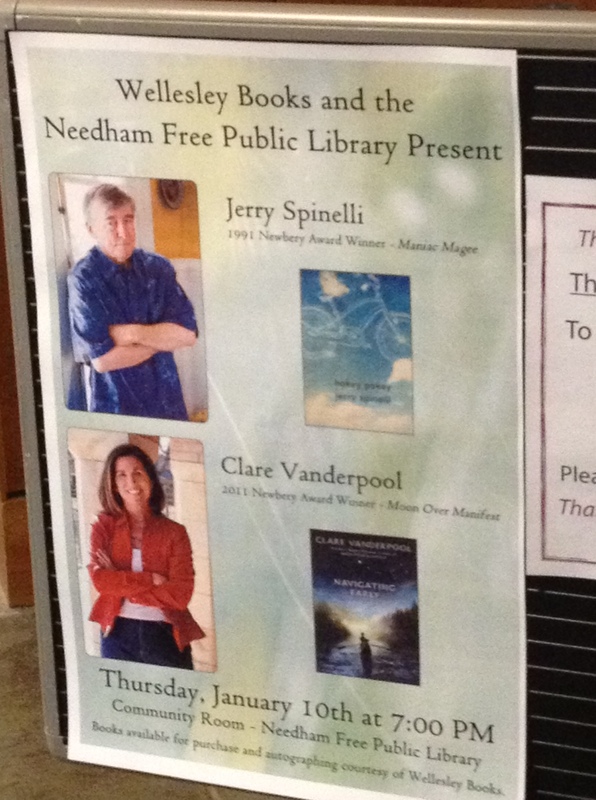 I had just attended an event hosted by the Needham Public Library & Wellesley Books where these two amazing authors discussed their new releases– Navigating Early (Vanderpool) & Hokey Pokey (Spinelli)— had a moderated chat, and then hosted a Q&A session. I’m not sure what my favorite moment of the night was… possibly when Jerry Spinelli waxed poetic talking about his pet rats… probably when they both vehemently declared they did not believe in the existence of writer’s block. This, THIS is the time all those writing books and seminars had been preparing me for when they yelled “Get a good elevator pitch!” And so? Was this the moment when a finely-crafted elevator pitch rolled off my tongue? Was it at least the time I gave a vaguely-cogent-if-slightly-rambling synopsis of my book? What did I do? I blurted “GOLDEN BOY!” at them, and pushed two business cards across the table, possibly accompanied by the words “Here. Card,” and then I ran. So yes, today’s trip was successful. I not only landed signed copies of some wonderful books, but I also learned something valuable. It took me the entire 40-minute drive home, brainstorming out loud to my ever-so-patient husband… but I think I now have an elevator pitch. Or, as it shall forever be referred to in my house, my Clare & Jerry pitch. This entry was posted in Interesting People, My Crazy Life. Bookmark the permalink. Oh my gosh, that always happens to me! At least you told them you were a debut author–usually I can’t even get that out. What an endearing post. I’m sure they thought you were adorable. So funny! It was nice to meet you there (I was the moderator), and I thought your elevator pitch to me was really good! Obviously, since that’s why I went to your website and checked out your blog. Good luck with Golden Boy.